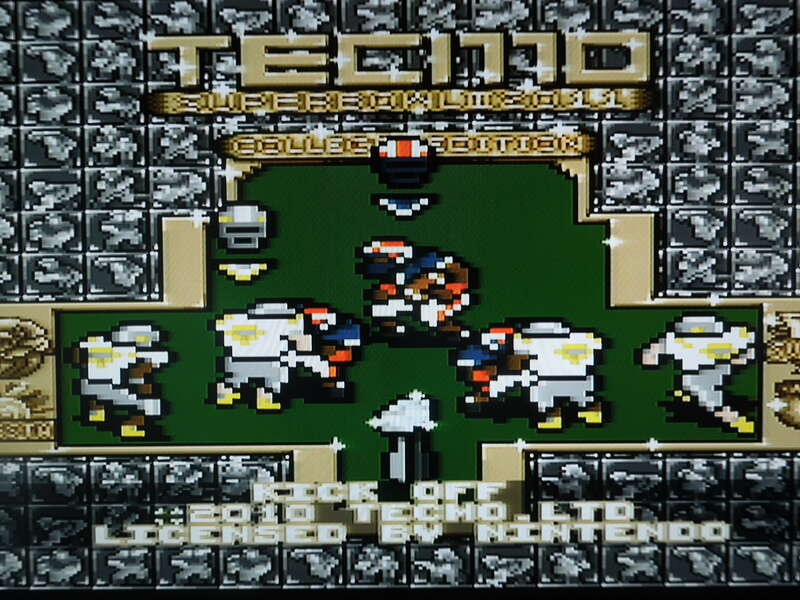 Finally, a college Tecmo Bowl on a SNES cartridge! Note 1: Like football games? 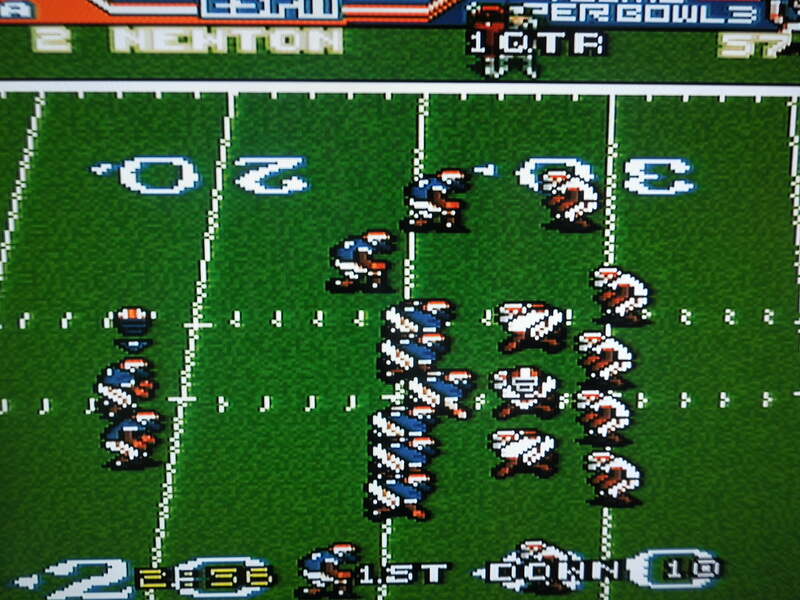 Check out my reviews of Tecmo Bowl Japan, Tecmo Bowl Arcade, SEC Tecmo Bowl, and Football Frenzy! 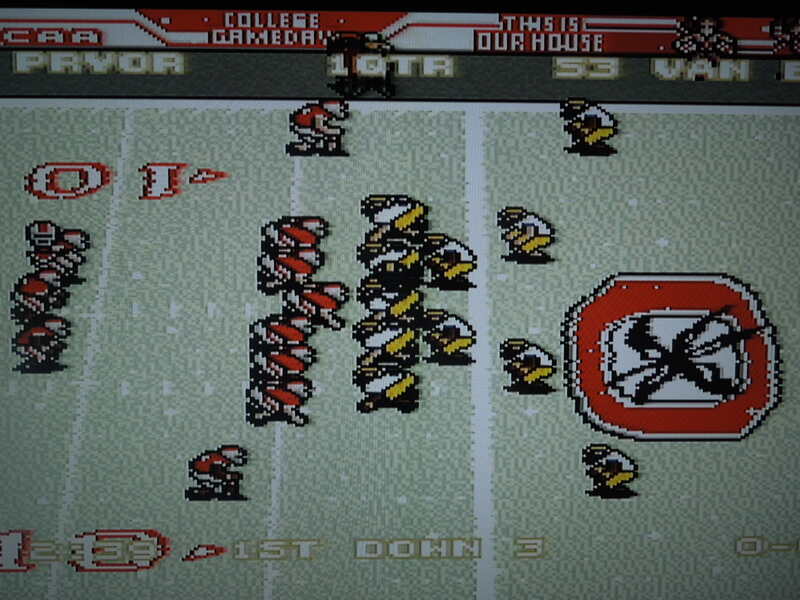 Note 2: This game was played on an original model SNES console with S-Video cables. It was connected to a 32-inch HD tv. 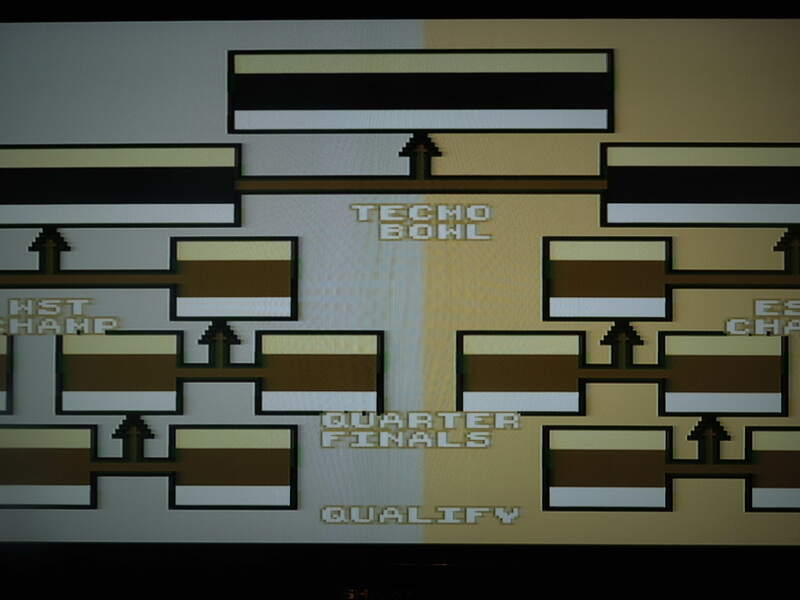 Quick History: Tecmo Super Bowl III: NCAA 2011 is a fan-modified version of the Super Nintendo game, Tecmo Super Bowl III: Final Edition that was originally released in 1995. That game was an NFL football game, and it included all 30 teams that were in the NFL at that time; it also included the names of all NFL players, as well as the correct team colors and logos. 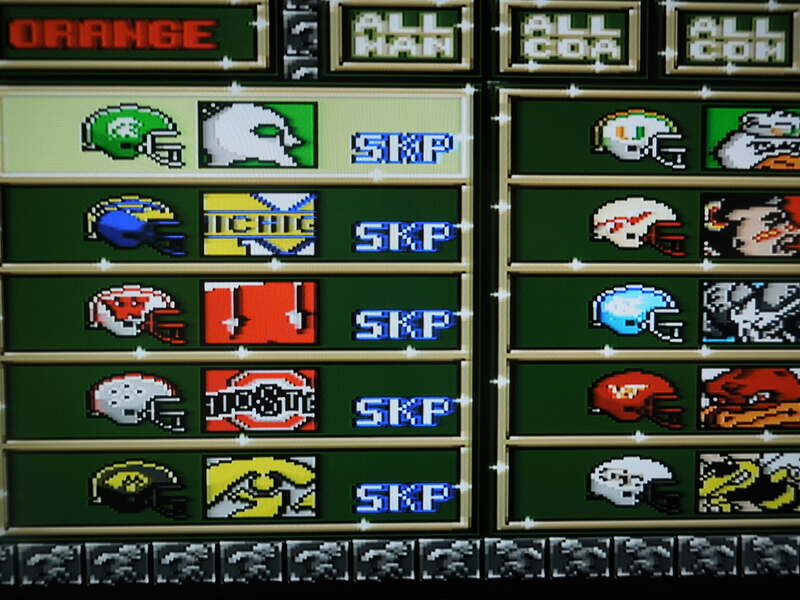 The modifiers of TSB III: NCAA 2011 amazingly altered almost everything – changing the 30 NFL teams to 30 of the 125 teams in Division 1 (FBS) college football. 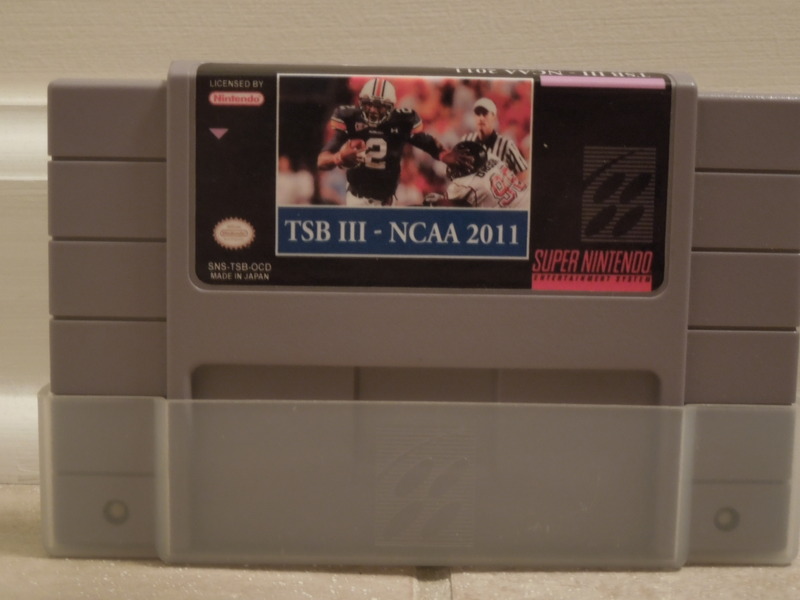 TSB III: NCAA 2011 also includes the player names, correct college colors, and logos from each of the 30 teams that were selected for inclusion. When you select your team, the modders even included the name of the conference and final 2010 BCS ‘ranking’ that your school finished with. So, for example, Auburn finished 2010 as no.1; TCU finished as no. 2 – teams that weren’t ranked in the top 25 at the end of the 2010 season have an ‘NR’ beside them. 30 college teams are included in the game. Sugar Division: SEC and Big 12 schools. 1. Scrimmage: This allows you to play a quick match against the computer, or against another human player. 2. Road to the BCS: This season mode allows you to play an 11-game regular season. During your season, you will play all of the teams in your division (9 schools), with the 4 teams in your specific conference saved for the last 4 games of your season. You will also play 2 random teams from other divisions. So, for example, if you select Stanford, you’ll play all teams in the Pac-10 and Big East (Fiesta Division), plus 2 other random schools during your regular season. At the end of your 11-game season, if you have the best record in your conference, you’ll be selected for the Playoff (you can also get into the 12 team playoff by being a ‘wild card’ – if you have a really good record but didn’t necessarily win your conference, for example). The game’s battery saves your season progress, by the way, in addition to player stats, team stats, etc. 3. BCS vs. Great: Here you can play in the ‘East’ vs. ‘West’ game, with the best All-American players from all 30 schools put onto either team. It’s like the Senior Bowl in actual college football. 4. Blue Chip Editor: Here, you can create your own player and keep track of his statistics as you play the game. 5. Team Info: Here, you can look at each team’s players, statistics, records, etc. You have the option to change players around or change your playbook entirely. 6. Options: Here, you can change certain elements of the game, like the length of time per quarter, if fumbles will occur or not, and if players can get injured or not. The Iron Bowl? Heck YES. Team Differences: When you select a team, you’ll have a small bar graph that depicts how good your team is on Offense or Defense. Some teams have full bars for both O and D, while others are low in each category; still other teams may be high in one category but low in the other. Thus, not all teams are created equal. Also, some teams may not be particularly high in Offense or Defense, but they may have one particularly fast or hard-hitting play maker. This difference in teams makes playing the season mode especially fun – some teams you’ll dominate, while others you’ll be in barn-burners with. There is no one team that is so awful that you can’t win the National Championship with them though, so don’t worry if your school isn’t particularly proficient at Offense or Defense. You’ll play an 11-game regular season. Control for Offense: At the beginning of each offensive possession, you’ll select from ‘Team Plays’ or ‘Universal Plays.’ Once you have selected between these 2, you’ll be presented with 8 plays – 4 pass plays and 4 run plays. You have a schematic for each of these plays to show you where receivers will run, where the running back should go, etc. On the field, A hikes the ball and cycles through your receivers (if you’re passing). When you’re running with the ball, rapidly tapping A increases your ability to break tackles or makes your player ‘spin’ out of tackles. B throws the ball when you’re the quarterback. Before the snap, pressing X pulls up an ‘audible’ menu on-screen, allowing you to change the play on the field. When running with the ball, Y makes your player dive forward for a yard or two. Team and Player Stats are saved throughout the season. Control for Defense: At the beginning of each offensive possession, as the defense, you’ll first select among 4 formations: Goal Line, Normal, Nickel, and Dime. 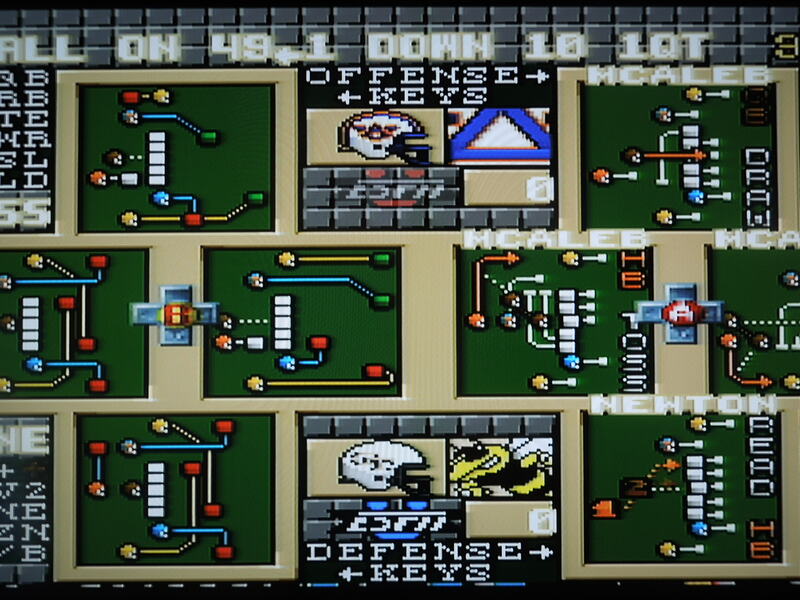 After that, you’ll see the offense’s 8 plays, and you’ll have to choose which play you think they’ll run. If you select correctly, you’ll most likely stop their play immediately after the ball is snapped. On the field, before the snap, A cycles through all the players (you can’t change defensive players once the play has started). Tapping A increases your ability to run through offensive blockers or bring down ball carriers. B causes your player to attempt a diving tackle. Controls for Special Teams: On kickoffs, you’ll see a bar at the bottom of the screen. Press A when it’s full, and you’ll kick it all the way to your opponent’s end zone (you can steer the kick by pressing Up or Down). Kick it when it’s barely full (and in blue), and you’ll attempt an onside kick. As the receiving team (on kickoffs or punt returns), pressing B while the ball is in the air will cause your player to call for a fair catch. You have a 16 total plays to choose among on offense. 12 of the 30 teams will qualify for the Playoff at the end of the regular season. All the fun of college football: Fake punts, flea-flickers, 2-point conversions, overtime (sudden death): all are included in TSB III: NCAA 2011. There are also in-game cutscenes for big plays, like blocked punts, field goal tries, and touchdown celebrations. So, where can I find this game? There are many SNES reproduction websites that may be able to make it for you by request, and some that already have it for sale. Do a google search for TSB III: NCAA 2011. 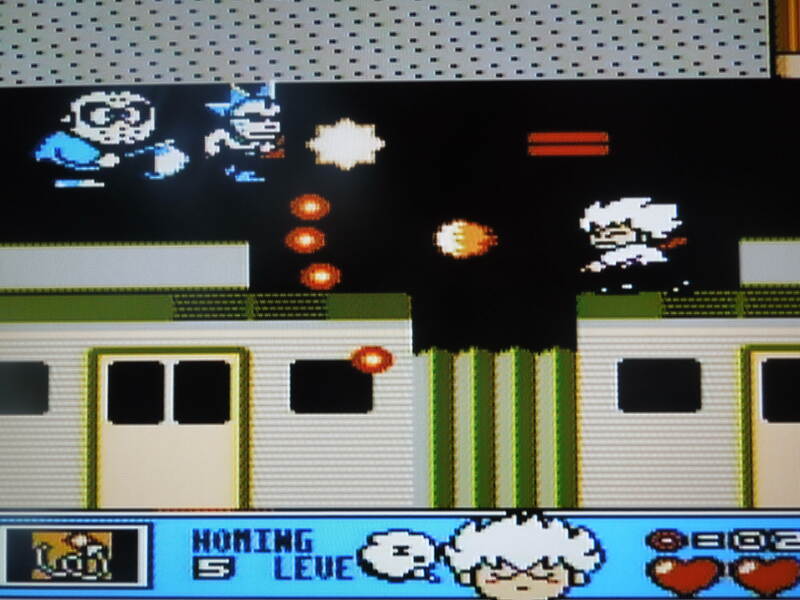 You can also play the rom on an emulator on your computer. 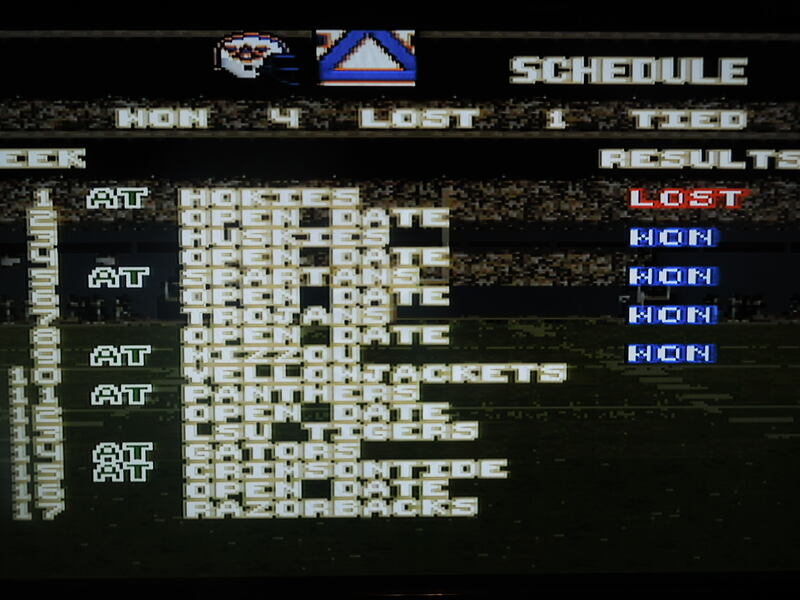 Conclusion: This was the game that many people always wanted Tecmo Bowl to be – a college football game, not an NFL game. I cannot imagine how much hard work the modifiers of this game put into making it what it is. 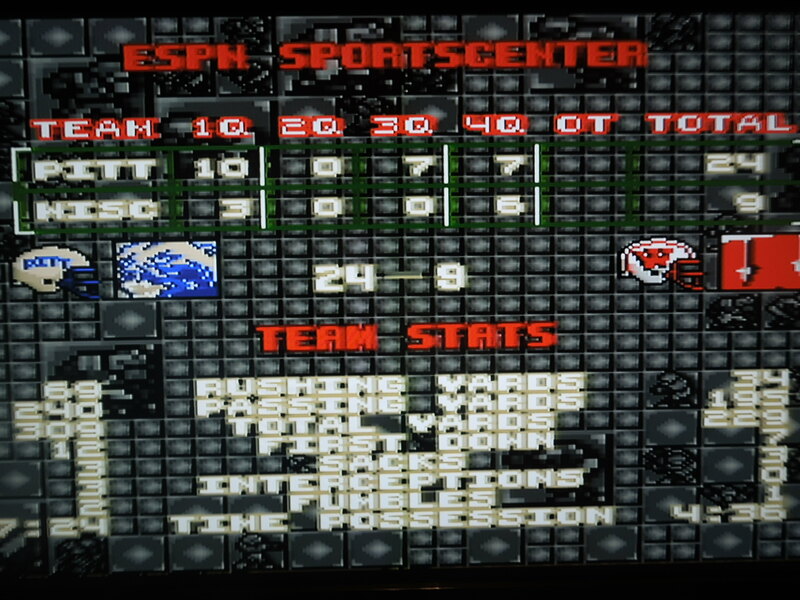 If you had never heard of Tecmo Bowl, you wouldn’t know this game was a mod. *Ok, to be fair, a few NFL phrases were left in on a couple menus, like the words ‘Pro Bowl’ – nearly everything else is college related. 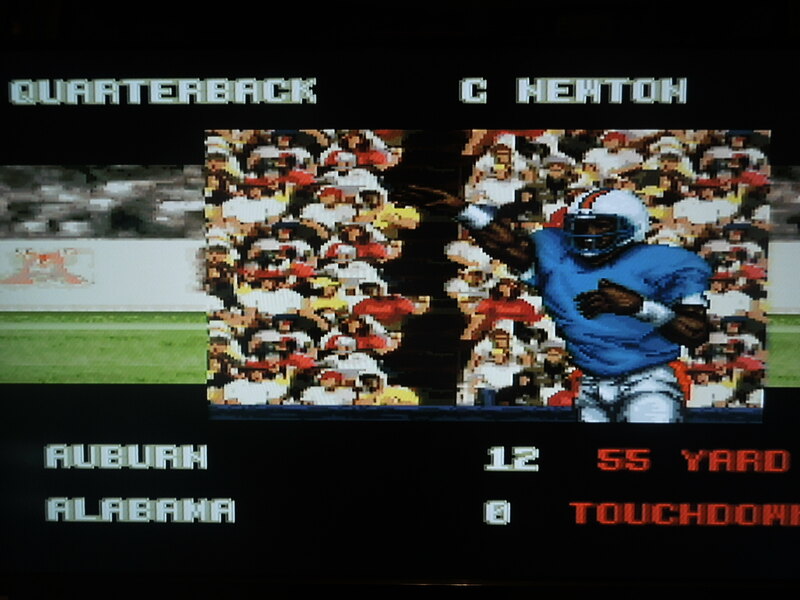 Also, for comparison’s sake, the graphics in this game look far superior to those found in the original game, Tecmo Super Bowl III: Final Edition. The game controls well, and although it may sound a bit complicated to play, it’s really not – it will take you approximately 1 quarter to have everything figured out. The only bad thing about the game (aside from the lack of music) is that it only has 30 Division 1 (FBS) teams from 2010. Unfortunately, your school may have been left out. *I believe the modifiers made a 2012 version (and maybe 2013 too) that took out some schools and added in others, like replacing Auburn with Georgia – you’ll need to search for the rom on the Internet if you’re interested. TSB III: NCAA 2011 is great because it allows you to play as some of the great teams and players from the 2010 season, like Heisman trophy winners Cam Newton (Auburn) and Mark Ingram (Alabama), or multiple NCAA record-holder Colin Kaepernick (Nevada). This game is a great homage to the 2010 college football season. Cut scenes play during big moments.